An inspirational quote painted on the cafeteria wall at Walnut Grove Elementary. Since Read Across America Day is today (Saturday March 2nd), the actual birthday celebration for Dr. Seuss was celebrated by many elementary schools on Friday, March 1st. 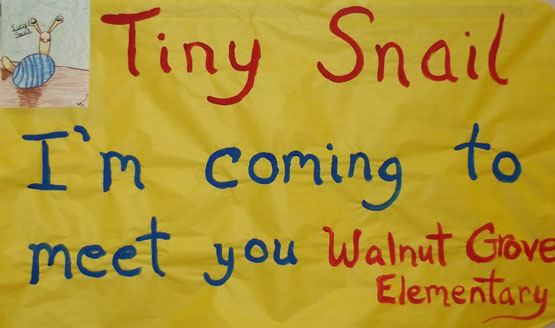 TINY SNAIL banner by Walnut Grove students. 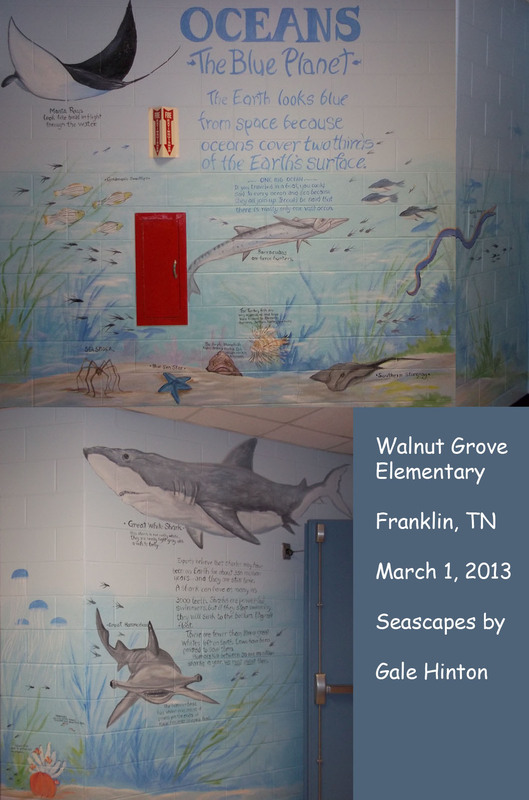 For this Seuss-tacular day I returned to a school I visited in 2008: Walnut Grove Elementary in Franklin, Tennessee. Students at this school celebrate Dr. Seuss’ birthday with a Rock-N-Roll Read-A-Thon every year. 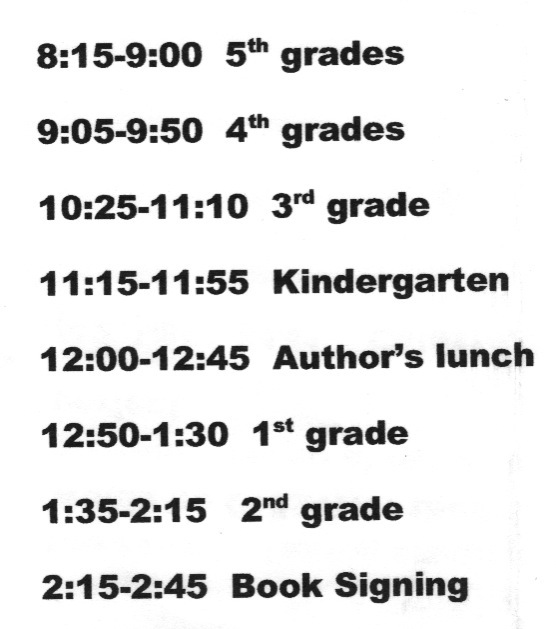 The school day is extended to 5:00 PM in order to accommodate the many Read-A-Thon activities. Students wore costumes reminiscent of the 1950’s. Girls pranced about in poodle skirts while the boys strode up and down the halls sporting sunglasses, white t-shirts, leather jackets, and loafers. They were so adorable! Throughout the day children ‘hopped’ into a favorite book during the sock hop in the gym. 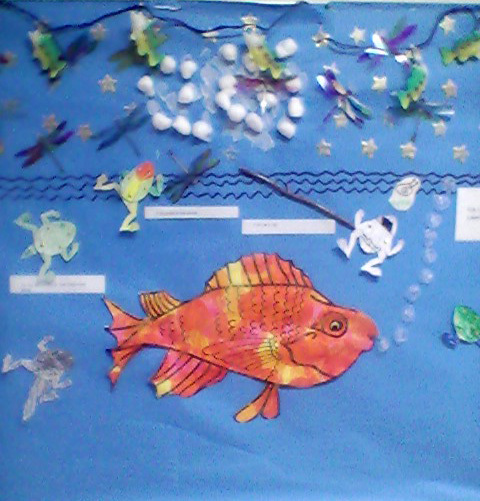 My author program took place in the cafeteria. 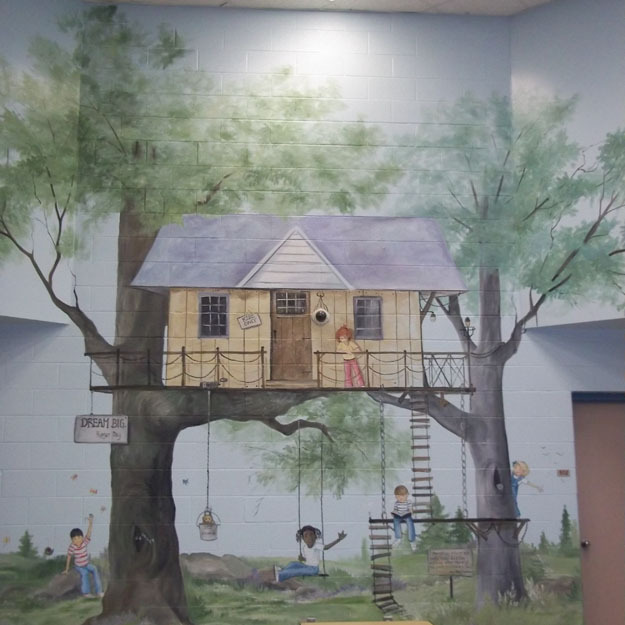 Mural in the Walnut Grove cafeteria. 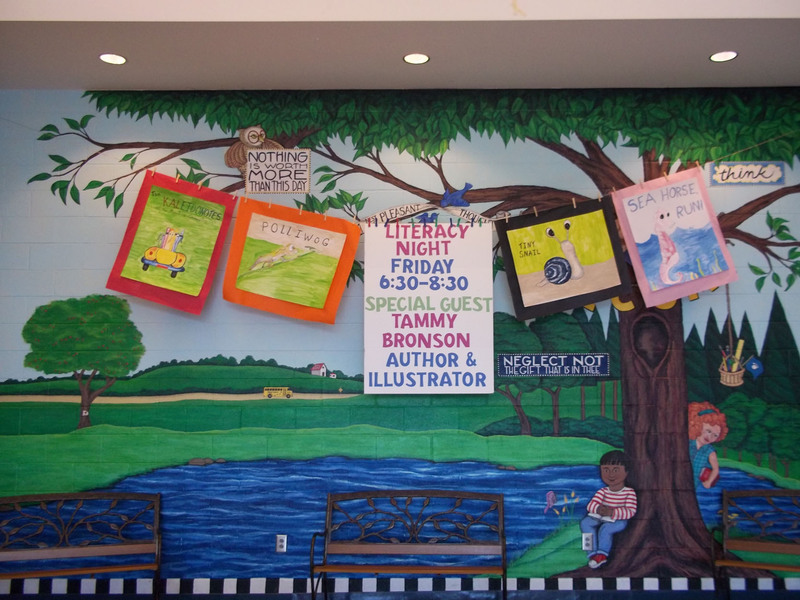 The last time I visited Walnut Grove, the walls in the cafeteria and halls were white and adorned with art by students. 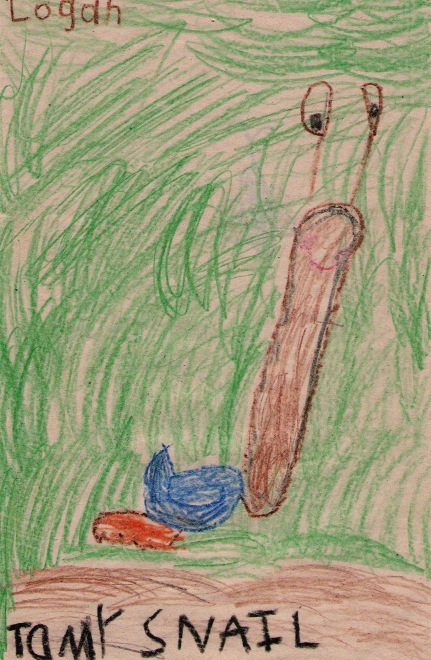 (See my blog post: 2008 Walnut Grove Student Art.) 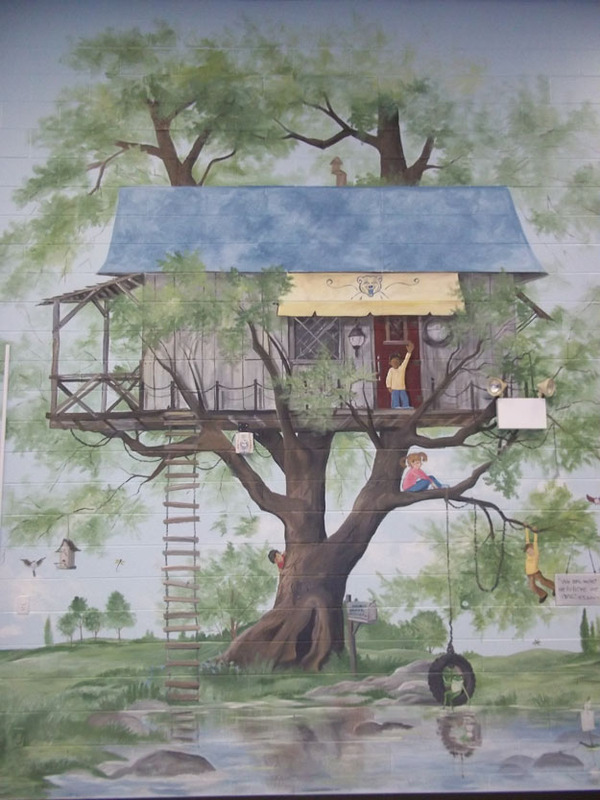 Since my last visit in 2008, Gale Hinton painted amazing murals on the walls. 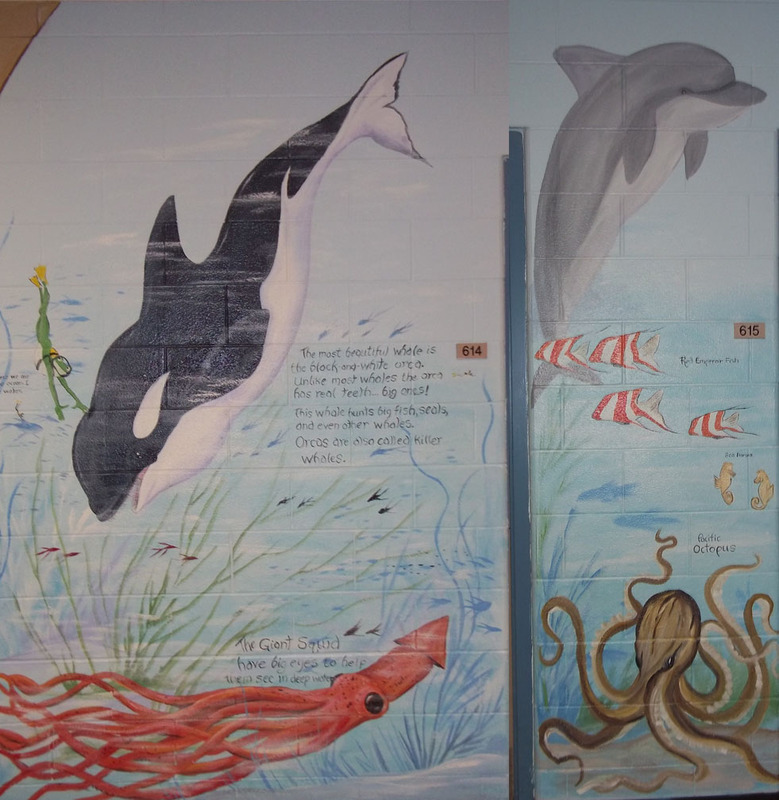 Of course my favorite murals were of the sea life. 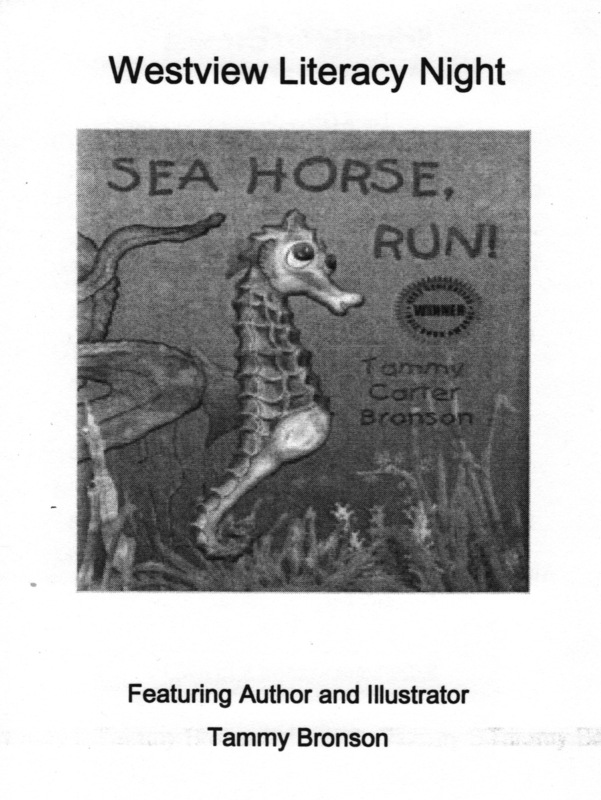 You can learn more about Gale’s beautiful art on her website at http://www.galehinton.com. An army of parent volunteers made this day possible for the students, and I want to especially thank Megan for coordinating our visit as well as Catherine Brown for introducing me to students. Her cheerful presence throughout the day was an awesome contribution to the program’s success. 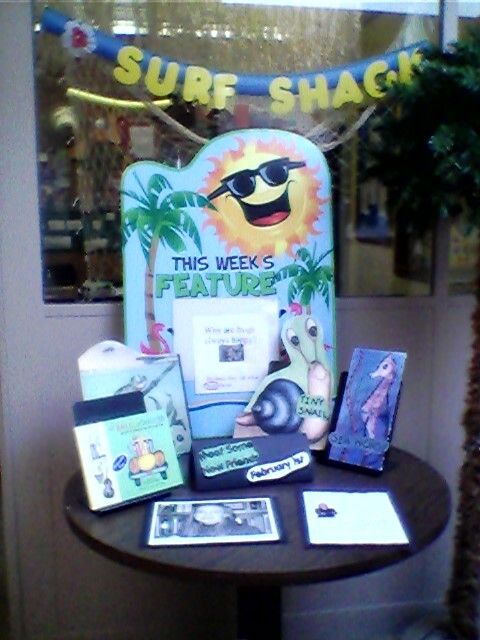 Keep reading Walnut Grove! From Hoover, Alabama I drove north to Franklin, Tennessee where I planned to visit three more schools celebrating Read Across America, but when I arrived, everyone was buzzing about “Manhunt Monday.” All Williamson County schools were closed on February 25th so authorities could search for a school maintenance worker accused of firing a shotgun at his wife and children over the weekend. The maintenance worker had keys to every school in the district, so every school in the county closed until the man was apprehended. Thankfully he was found Monday night. Students returned to school on Tuesday, and although my first author visit in Franklin was scheduled at Edmondson Elementary on Wednesday, February 27th, the incident was still fresh in everyone’s mind. Edmondson Elementary has over 700 children, and the students and staff are fortunate to have a very large and active PTA to support their endless stream of activities. 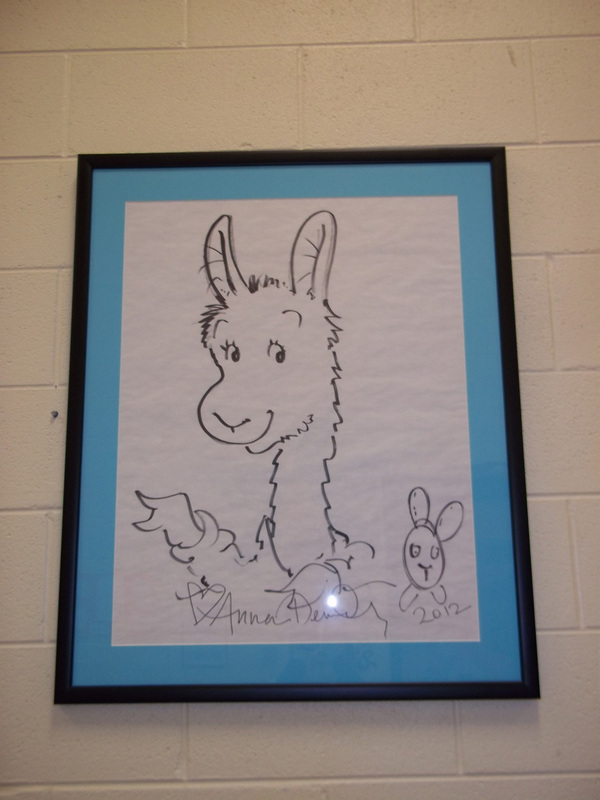 My author visit was the perfect compliment to the school’s Read-A-Thon. 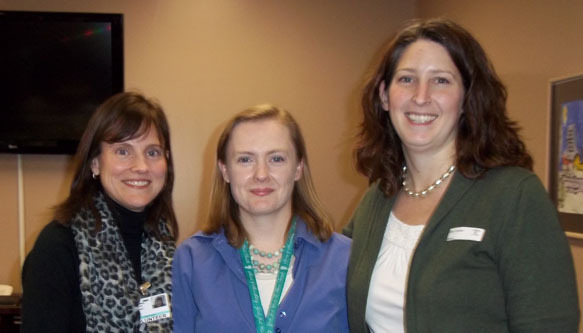 Patti Prasad (Left), Tammy Bronson (Center), and Dana Iverson (Right). Several members of the PTA were on hand for my visit. Dana Iverson made the most amazing shortbread cookies. They were perfect depictions of characters from my books. 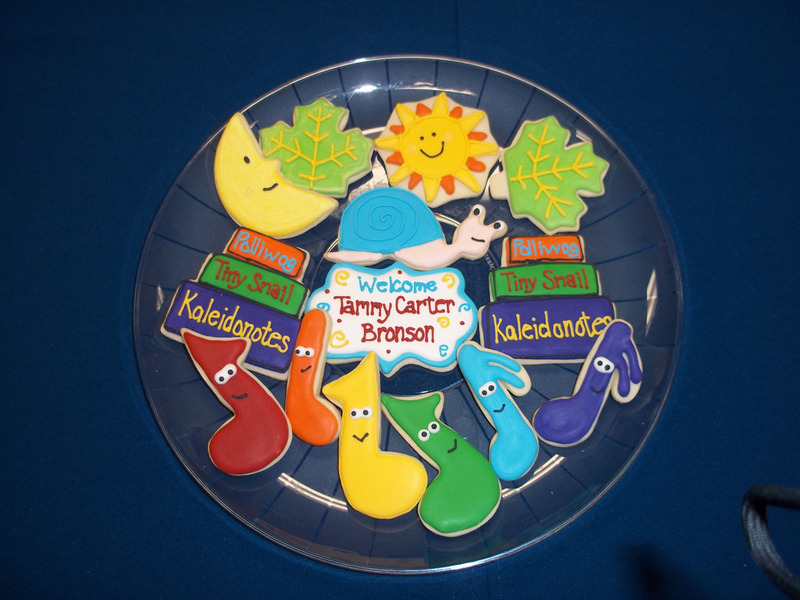 Many thanks to Dana for the best cookies ever, and thanks to Patti Prasad who was especially helpful before, during and after the visit. Edmondson Elementary rocks!!! 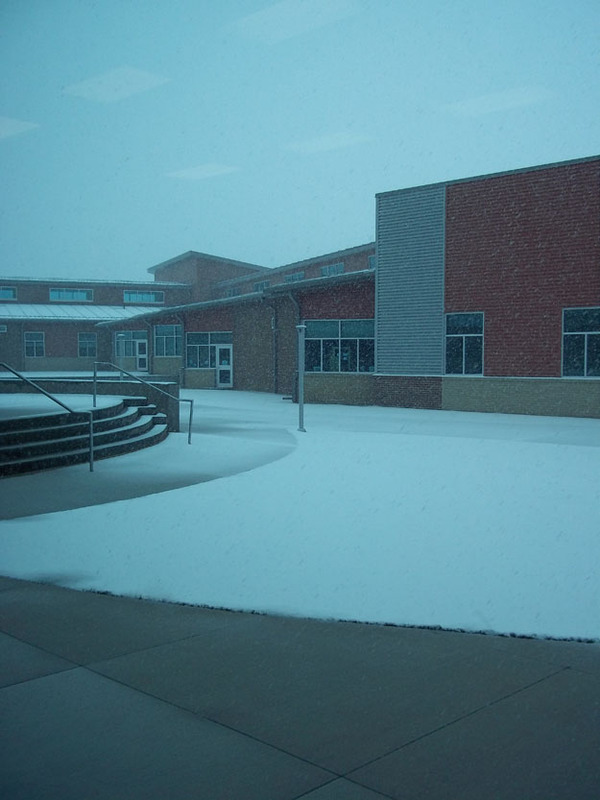 The following day I visited Johnson Elementary. It is one of five elementary schools in the Franklin Special School District (FSSD). 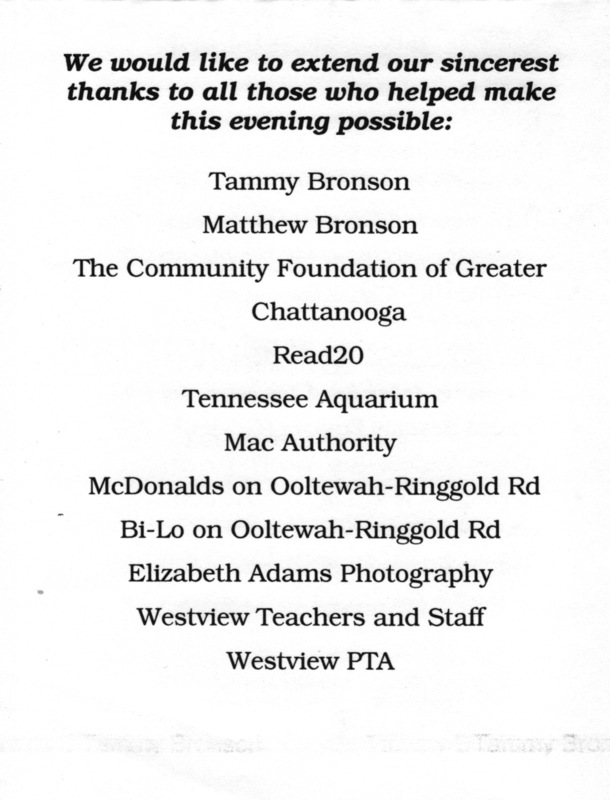 The principal, Tosha Robinson, invited me to speak with students on Thursday, February 28th. 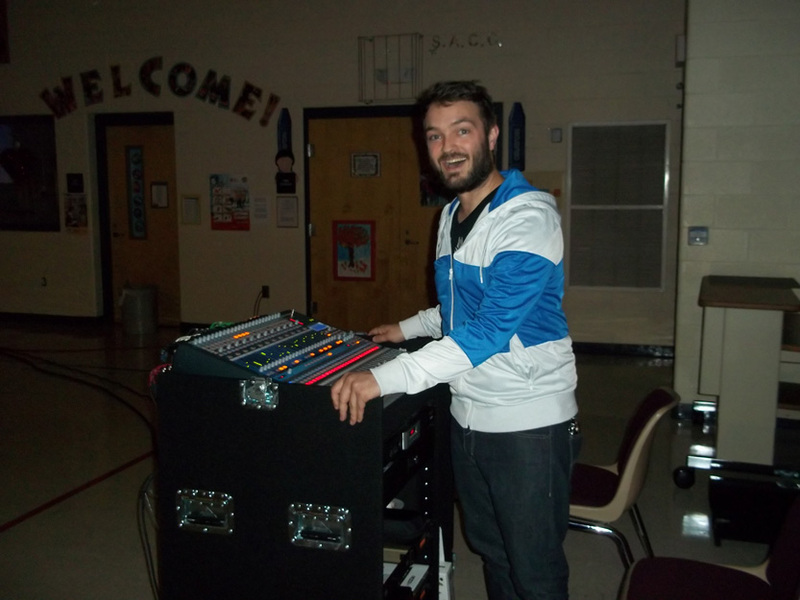 I set up in the gym at 2:00 PM and performed one presentation for all 450 (K-5) students in the school. This was one of the largest groups of students I have ever spoken to, but the program was a great success. I returned for Reading Night later that day from 6 to 8 PM. The primary focus for Reading Night was the Scholastic Book Fair, but many other reading programs took place including teachers and parent volunteers performing reading activities with children. 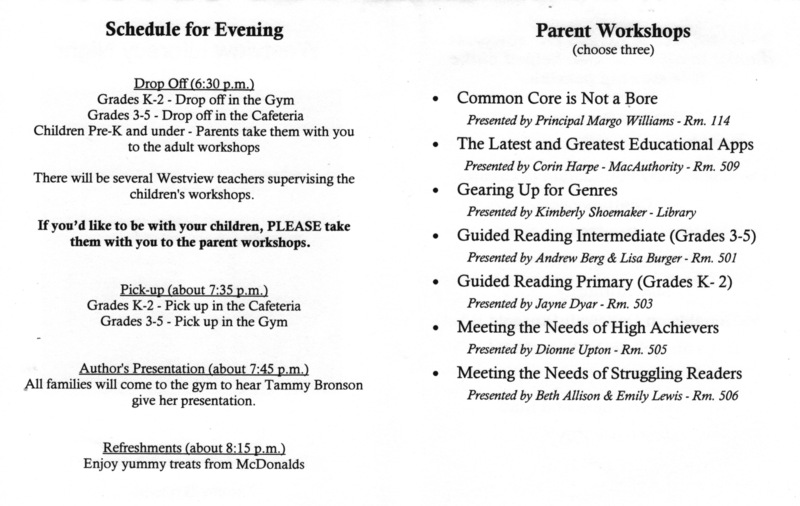 Many thanks to the Ms. Robinson for adding my program to the students’ busy curriculum. Read Across America Day is observed annually on Dr. Seuss’ birthday (March 2nd), but many elementary schools plan activities for the entire week leading up to the Seuss Birthday Bash. 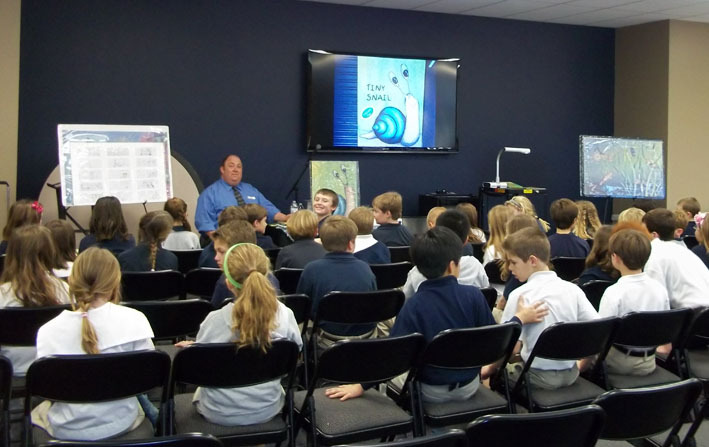 This is a popular week for author visits, and my Read Across America Celebration began on February 26th in Hoover, Alabama where I visited Prince of Peace School. The principal, Connie Angstadt, hosted a Writer’s Cafe where parents were invited to view the students’ writing. Each student at Prince of Peace keeps a writer’s notebook, and every year the student adds more stories or writing to their collection. 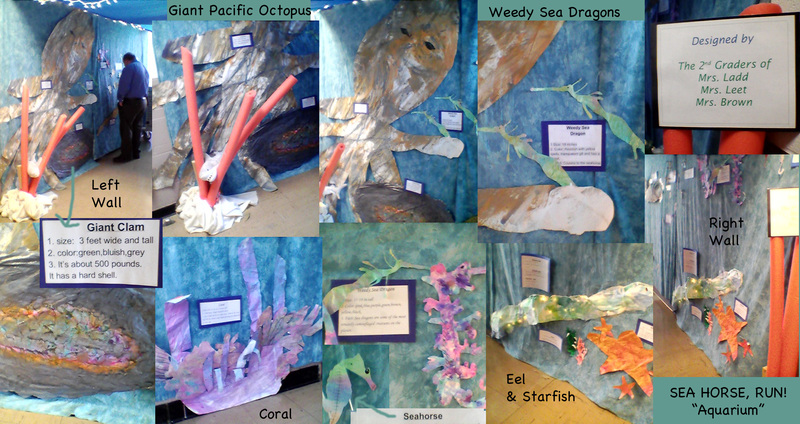 The older students (4th and 5th grades) had the largest collection of stories and art on display. 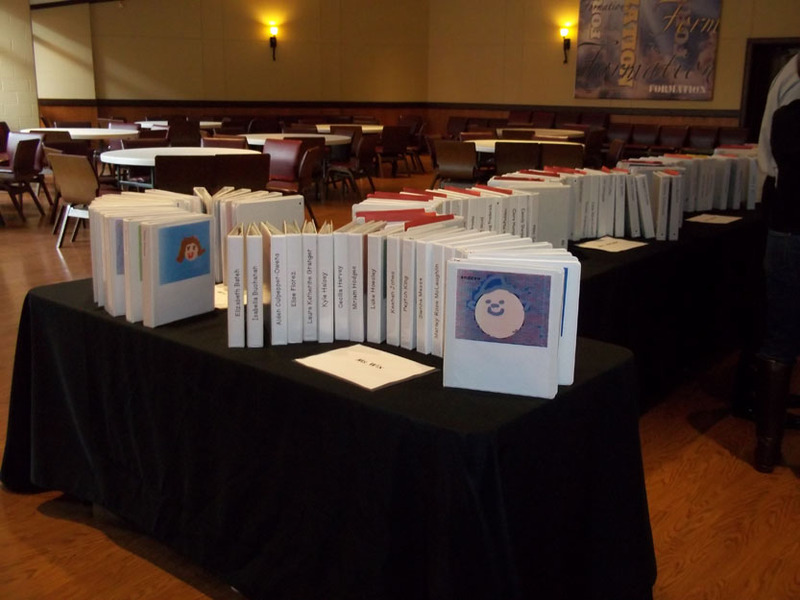 Tables displays were created to celebrate favorite authors or series of books. 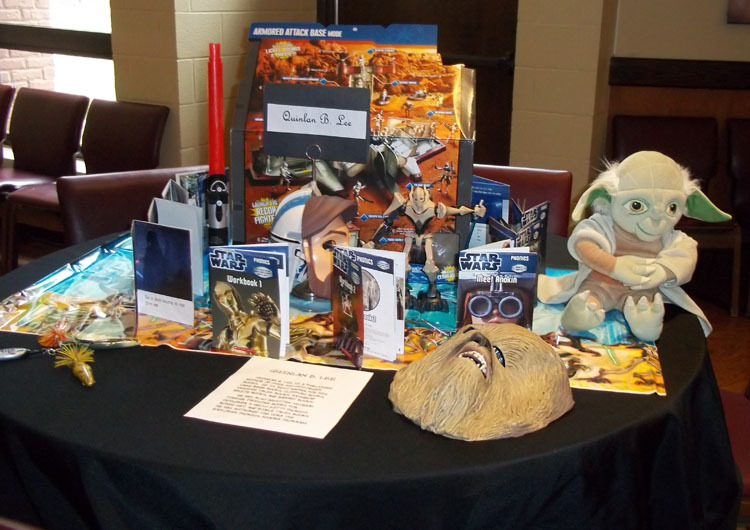 Of course one table was dedicated to Dr. Seuss, but others included Harry Potter, Lemony Snicket, and even Star Wars. 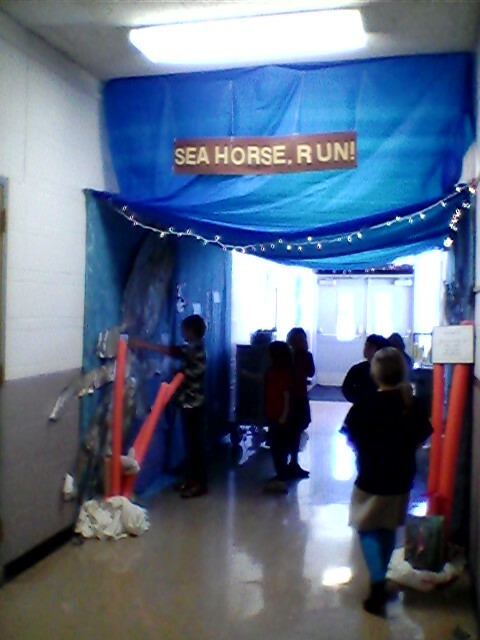 In addition to the Writer’s Cafe, the Scholastic Book Fair was in full swing in the library. I rarely perform an author visit during a book fair, but when I do, generally I speak to students in another part of the school such as the music room, gym, or an auditorium; but with parents visiting the Writer’s Cafe, the school was bursting at the seams. 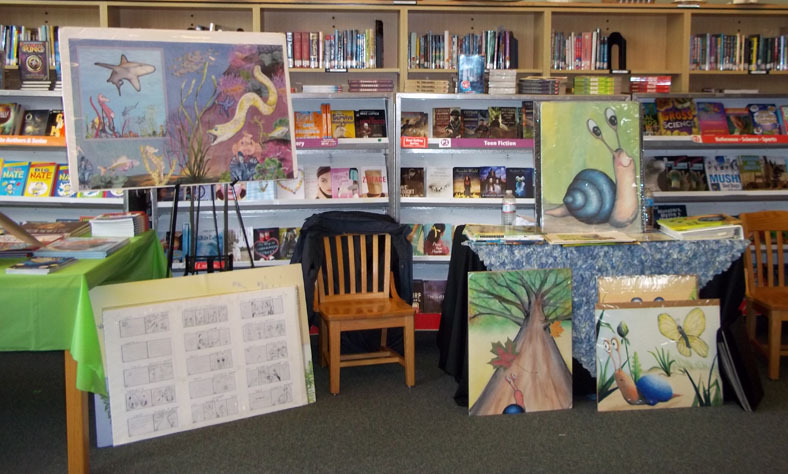 I set up in the library in front of the Scholastic book fair shelves, and the students squeezed in on the floor between tables smothered with books. The librarian, Midge Buote (known affectionately by all as ‘Ms. B’), was very accommodating, and we appreciate everything she did to make our day a success. My visit to Prince of Peace was a great start to Read Across America Week. 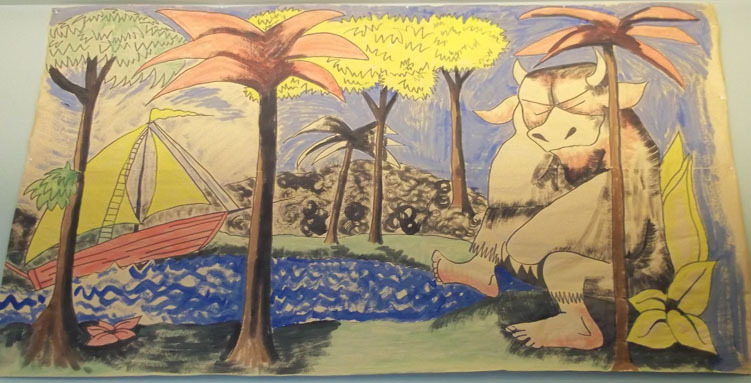 “Where the Wild Things Are” library mural painted by a parent volunteer at Prince of Peace School. 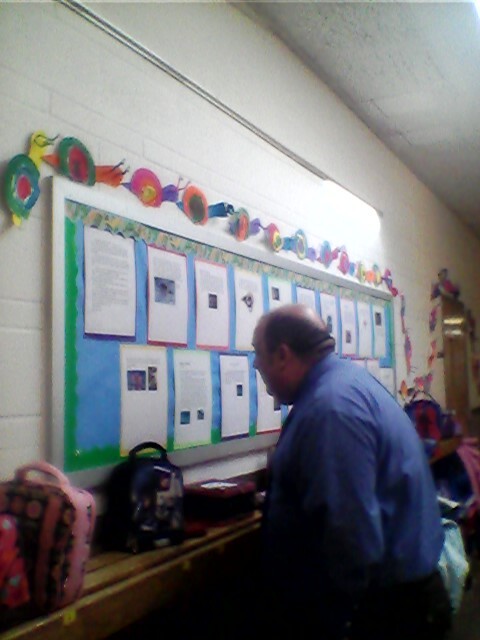 On February 20th my husband and I visited Willowbrook Elementary in Bentonville, Arkansas. 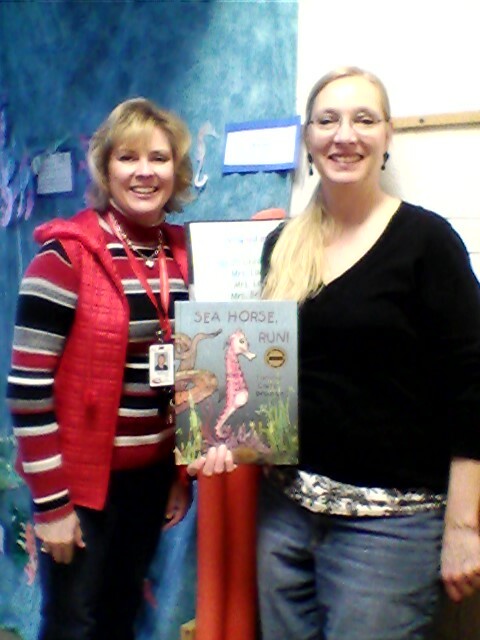 Willowbrook Library Media Specialist Danna Caudill (left) and Author/Illustrator Tammy Carter Bronson. It was a great treat to visit a school so close to home, and I must thank the Library Media Specialist, Mrs. Danna Caudill, for making this visit possible. Her passion for literacy and exceptional organizational skills created an event that made a lasting impact not only on the students but on the community as well. 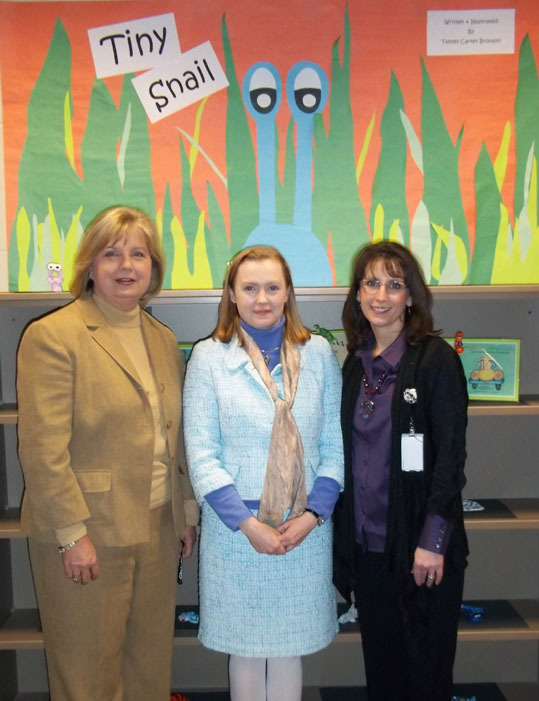 From left to right: Willowbrook Principal Cynthia Dewey, Author Tammy Carter Bronson, and Librarian Danna Caudill. 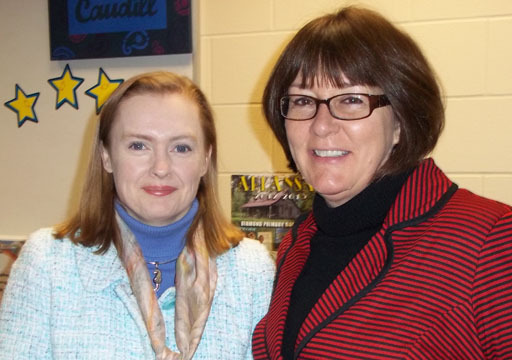 I met Mrs. Caudill at Oak Elementary in Bartlett, Tennessee during an author visit in November 2008. 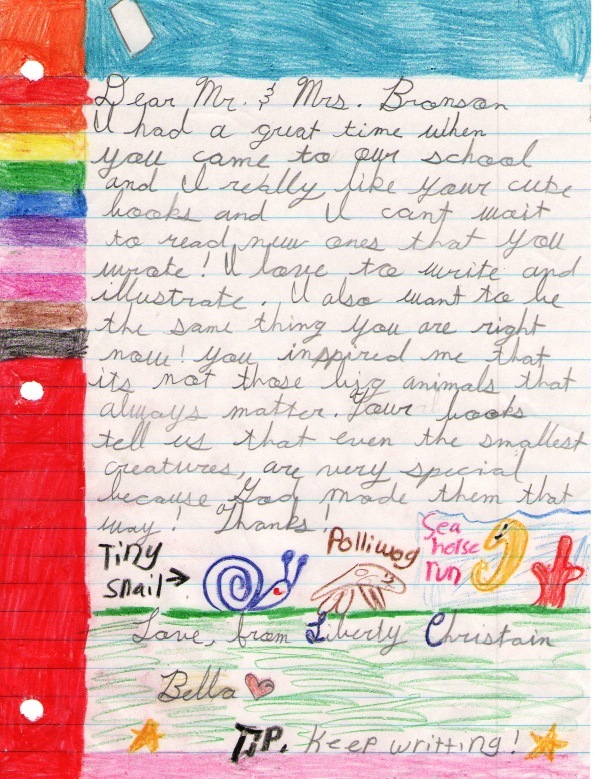 My program at Oak Elementary was a great success, and when Mrs. Caudill moved to Bentonville and took a position at Willowbrook, she encouraged the Principal, Cynthia Dewey, to choose Tiny Snail for the One School, One Book program which is designed to create a shared reading experience within a single elementary school community. 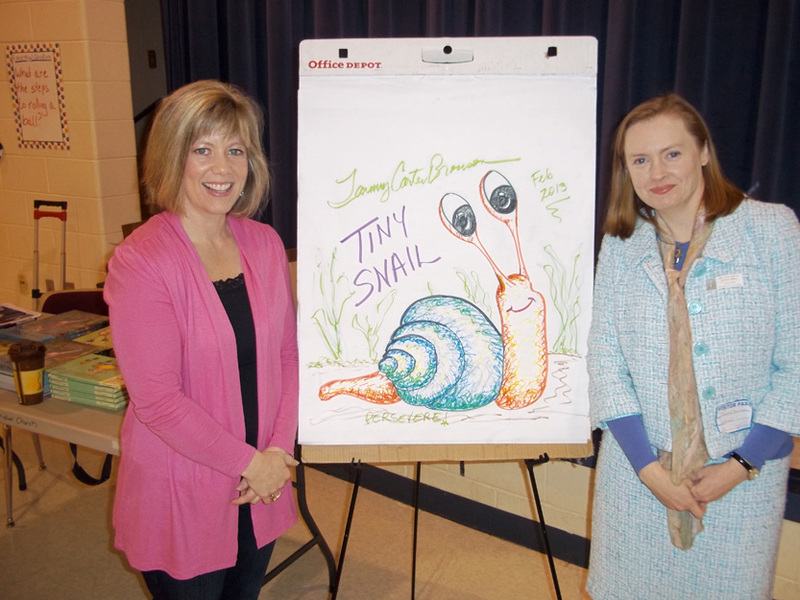 In January every child at Willowbrook received a copy of Tiny Snail, and over the course of a month teachers integrated the book into the curriculum. Author’s Tea and Breakfast at Willowbrook Elementary. Our visit began bright and early at 7:00 am on February 20th with an “Author’s Tea.” Teachers, staff and community leaders were on hand to meet and greet my husband and I in the school library. From left to right: Author Tammy Carter Bronson, Bentonville Mayor Bob McCaslin, Cave Springs Mayor Larry Smith, and Author Matthew Shane Bronson. 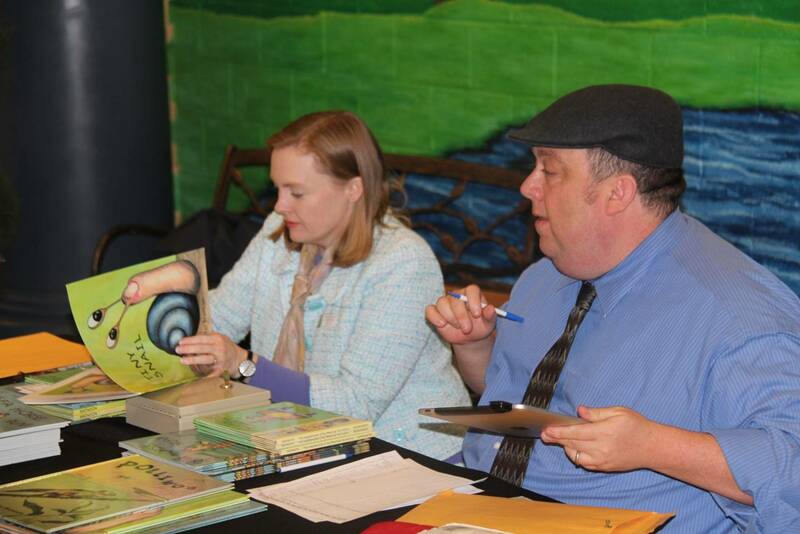 The mayors of Bentonville and Cave Springs attended, as well as members of the Bentonville school board and the children’s librarian at the Bentonville Public Library. 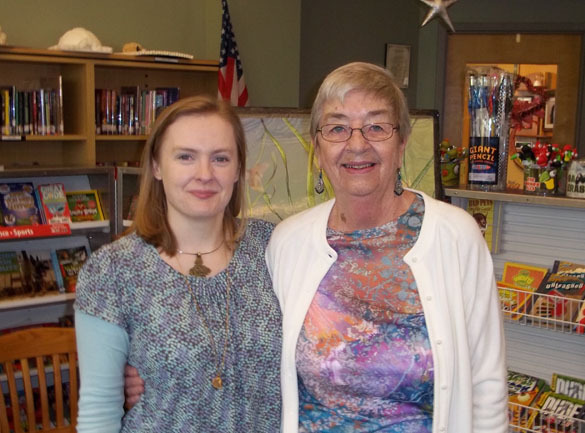 Author Tammy Carter Bronson and the children’s librarian at the Bentonville Public Library, Sue Ann Pekel. 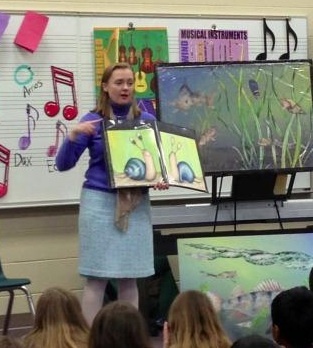 We set up for our program in the music room where we spoke to students one grade level at a time. Around midday it started to snow, but thankfully the precipitation quickly melted from the sidewalks and roads. 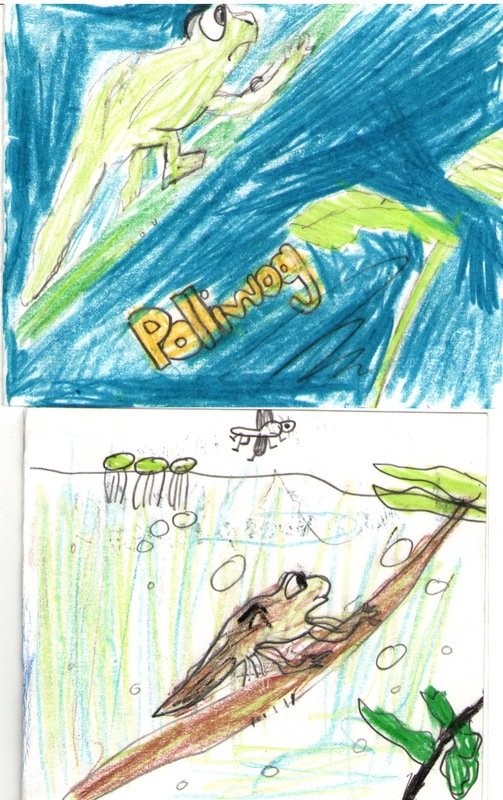 Every student at Willowbrook is an author and illustrator. 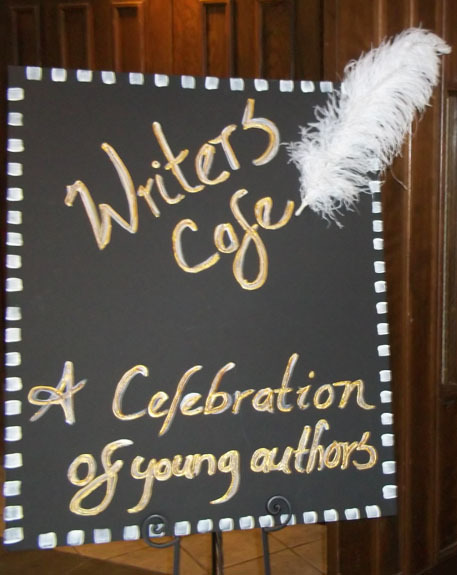 Congratulations Willowbrook students, and Happy Author Celebration Day! 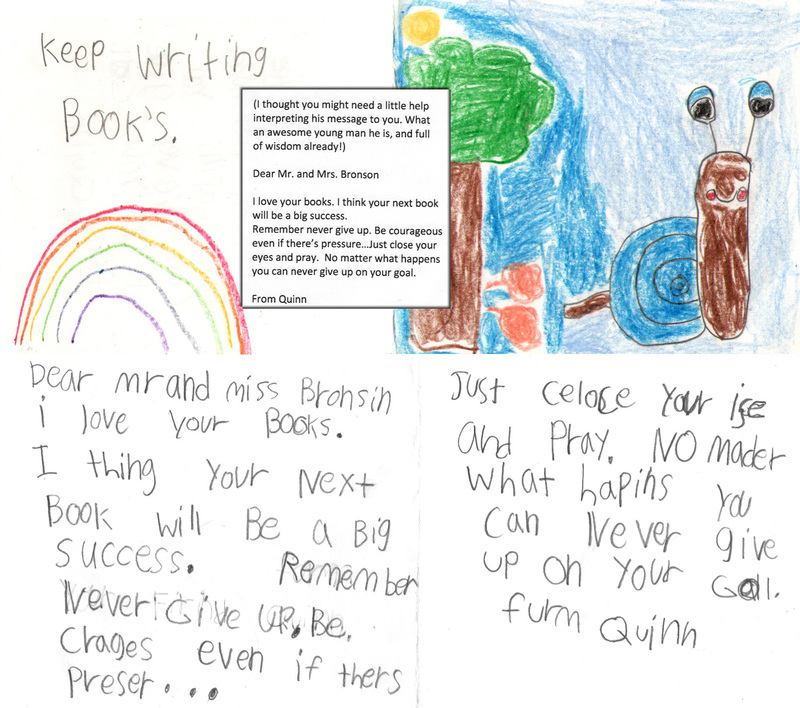 Willowbrook Elementary: Where Every Student is an Author! Valentine’s Day is a popular date for author visits at schools probably because this is a ‘free’ day for most schools with students exchanging valentines and enjoying parties. As a result, every year we visit a different school on Valentine’s, and this year we spent the holiday in Texas. 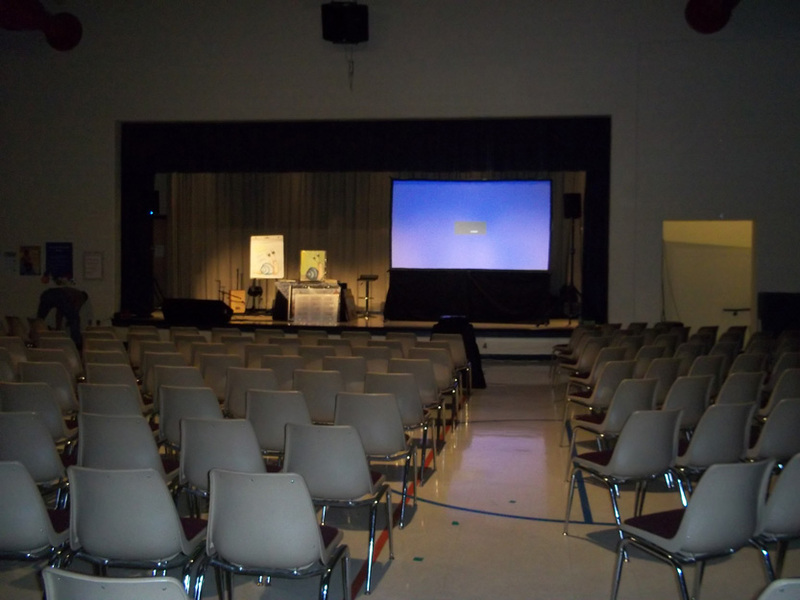 On February 13th we returned to Liberty Christian School. 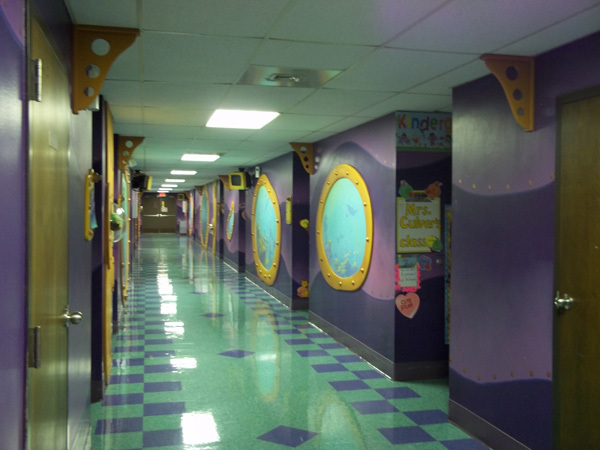 Our first visit to this fabulous school in Argyle, Texas took place on November 1st in 2011. (Read my blog post about the first visit). The librarian, Yvonne Lacy, enjoyed our visit so much that she invited us to return and speak with the younger students at the school. 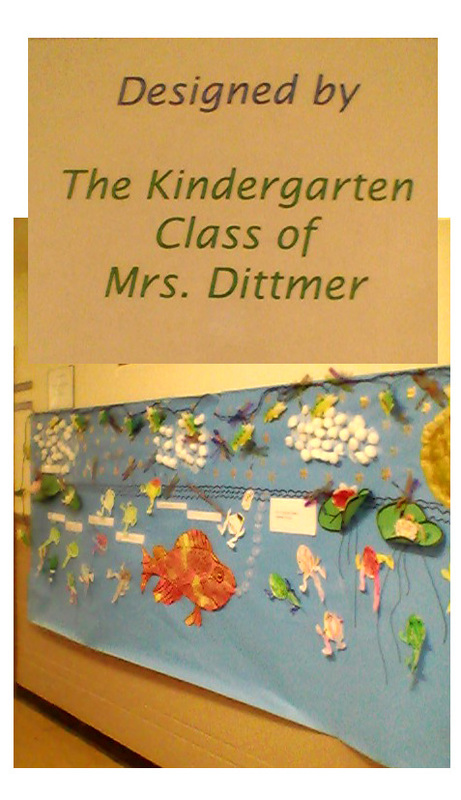 In 2011 we spoke to students in 3rd through 6th grade, so this year we targeted kindergarden through 3rd. 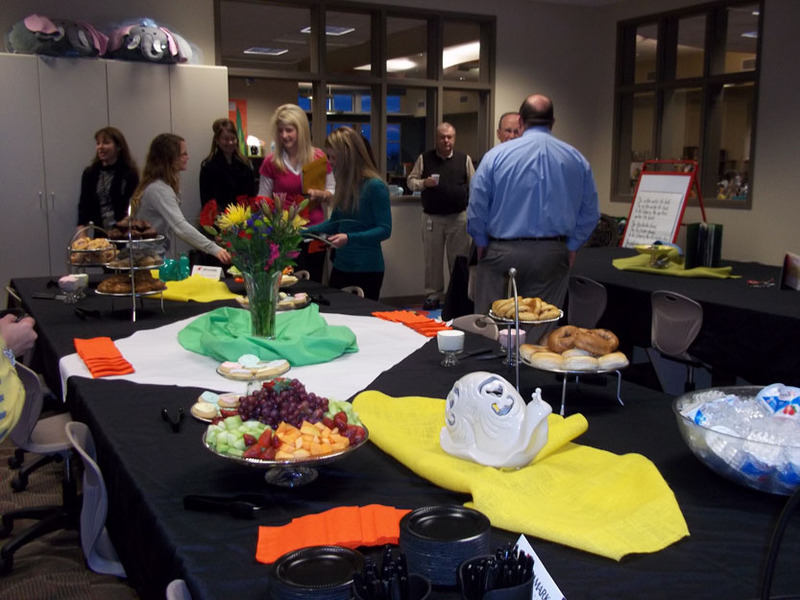 Our presentations took place in a new meeting room designed specifically for special programs. Matthew Shane Bronson preparing to speak with students at Liberty Christian School. I had a great time when you came to our school and I really like your cute books and I can’t wait to read new ones that you wrote! I love to write and illustrate. I also want to be the same thing you are right now! You inspired me that its not those big animals that always matter. 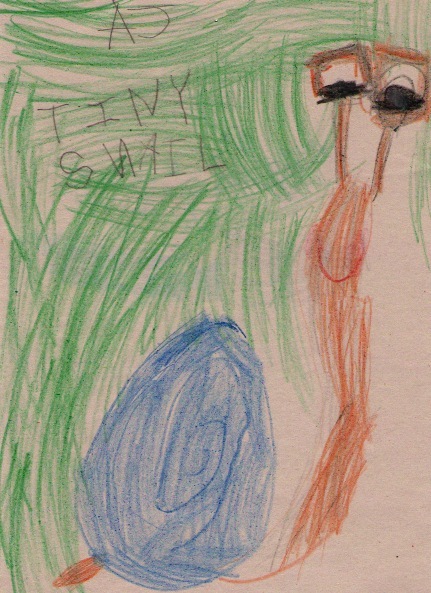 Your books tell us that even the smallest creatures are very special because God made them that way! Thanks! I am still writing, Bella! That evening (February 13th) we had dinner at Zanata’s in downtown Rockwall, and I have to say it was one of the best meals I have ever had. If you ever visit Rockwall, Texas, go to Zanata’s! The next day was Valentine’s, and we visited Heritage Christian Academy in Rockwall. Students gathered in the library to watch my program. We signed books for students in the school cafeteria during lunch, and we learned that one of the parents at the school is also an author. Anne Mateer has several books published with Bethany House. Her latest book, A Home For My Heart, will arrive in bookstores September 2013. Congrats Anne! 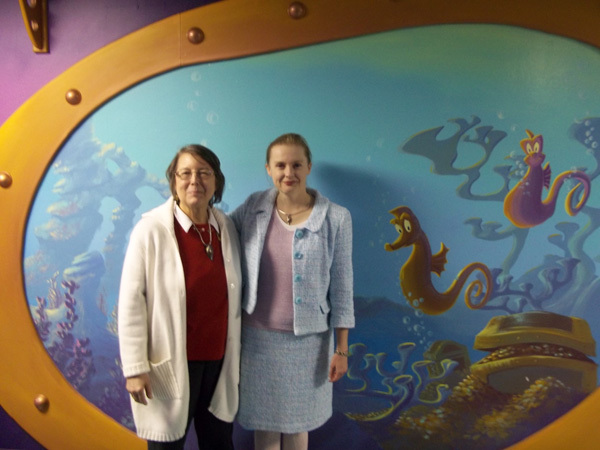 Shiloh’s Librarian, Melissa Merrifield (left) and Tammy (right). On January 25, 2012 I spoke to all the students in Kindergarten through 5th grade at Shiloh Christian School in Springdale, Arkansas. This was a special visit because Shiloh is a local Arkansas school, and I’ve visited them twice before: first on March 11, 2002 and again on February 26, 2004. Mrs. Merrifield has been the librarian at Shiloh for many years, and we are grateful that she has invited us to her school three times! 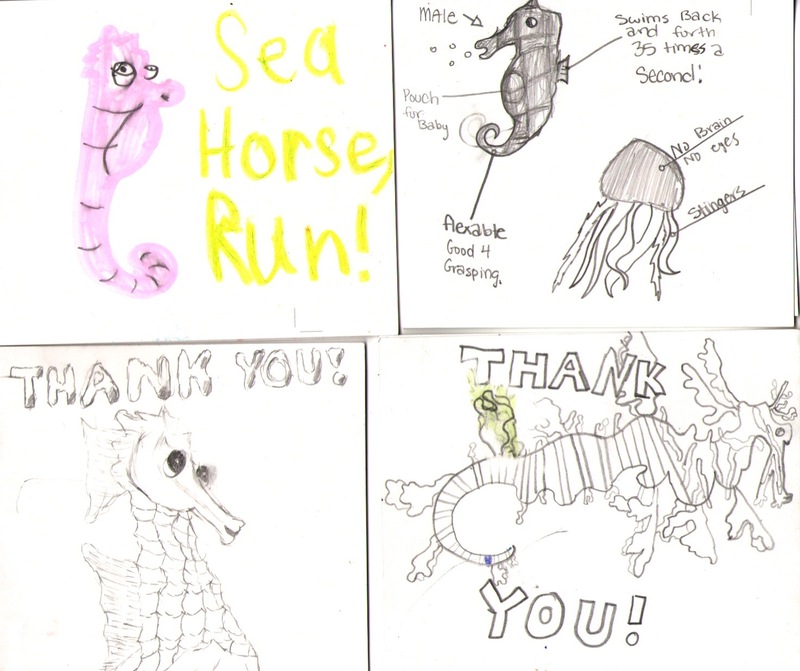 After our last visit, nearly every student in the school sent us thank you notes. They arrived in a large box. I read ALL of my fan mail. 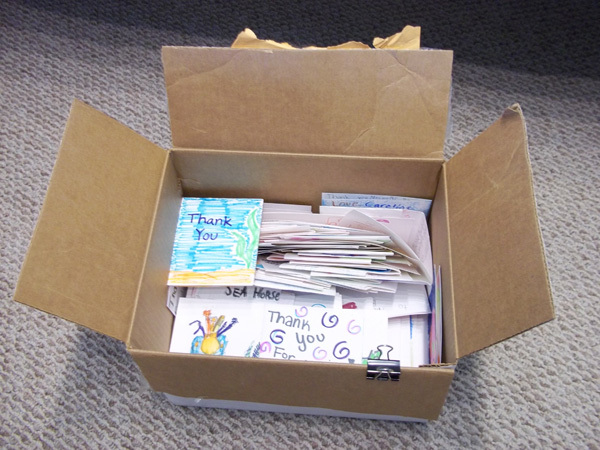 I keep my fan mail, but there is so much that most of it is stored in a drawer. I loved the letter pictured below so much that I keep it on the shelf in my office (right above my computer) where I can see it everyday. I love your books. I think your next book will be a big success. Remember never give up. Be courageous even if there’s pressure…Just close your eyes and pray. No matter what happens, you can never give up on your goal. With all my heart, thank you, Quinn! Your message means the world to me. I will treasure your excellent advice. 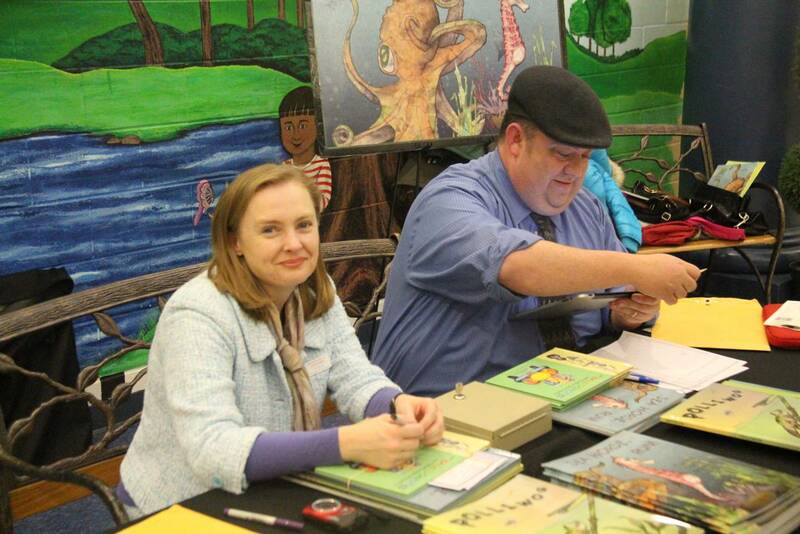 My author visit at Hope Sullivan Elementary on Friday, January 20, 2012 was a great success! 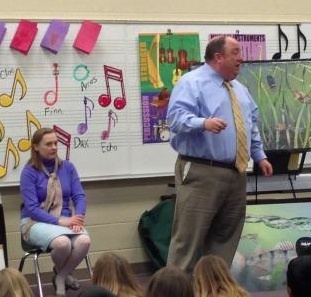 This was my first visit to Southaven, Mississippi, and I spoke to over 630 students in three presentations. 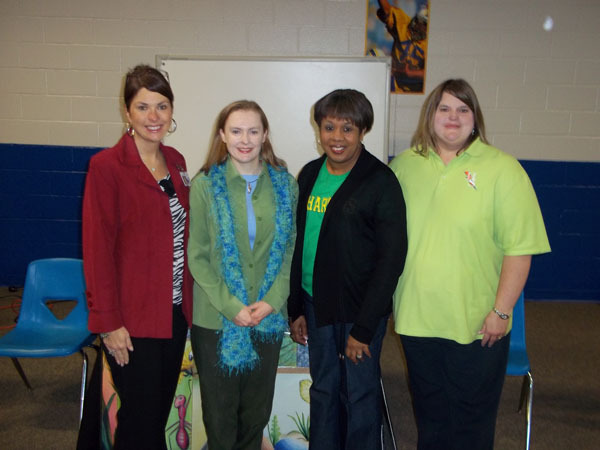 From left to right: Amanda Samples (Principal), Tammy, Terri McCain (Librarian), and Lisa Nye (Asst Principal). 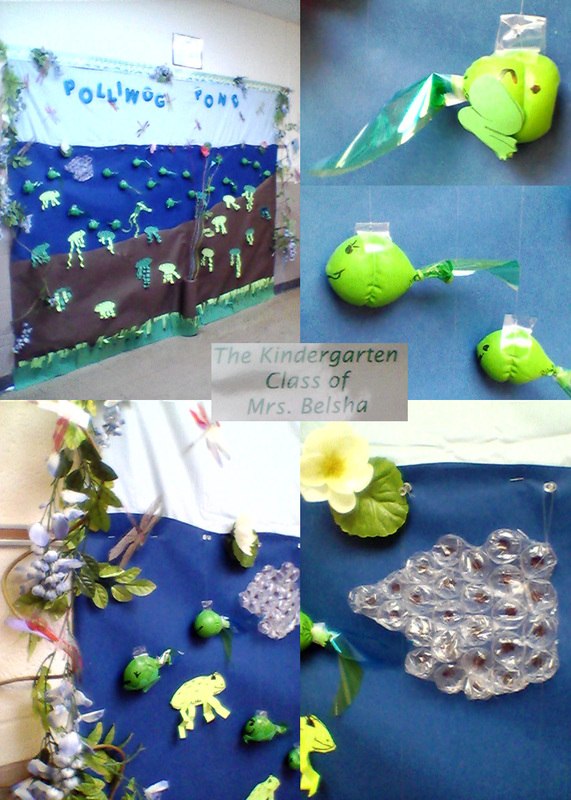 The faculty and staff were very involved on every level. The principal, assistant principal, and librarian encouraged students to participate, and they did! Their enthusiasm was uplifting, and I did not leave empty-handed. 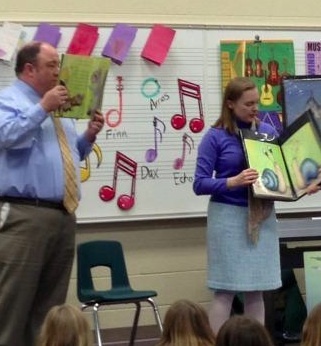 A teacher, Jan Hoselton, presented me with art created by her kindergarten students. 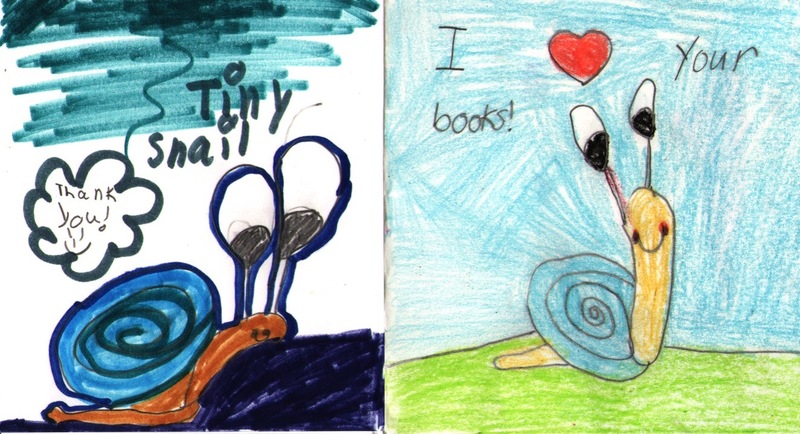 Tiny Snail book covers created by kindergarten children at Hope Sullivan Elementary. 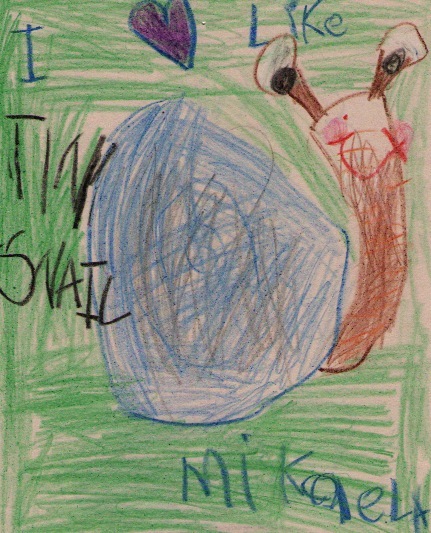 Mikaela loves Tiny Snail. I love her picture (above). 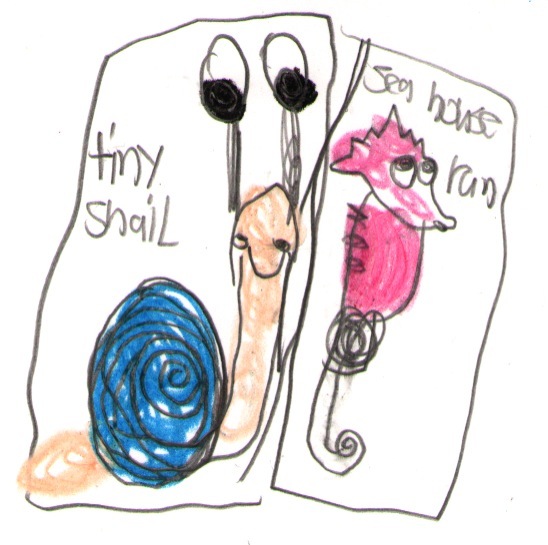 Logan combined my name with Tiny Snail’s (above). 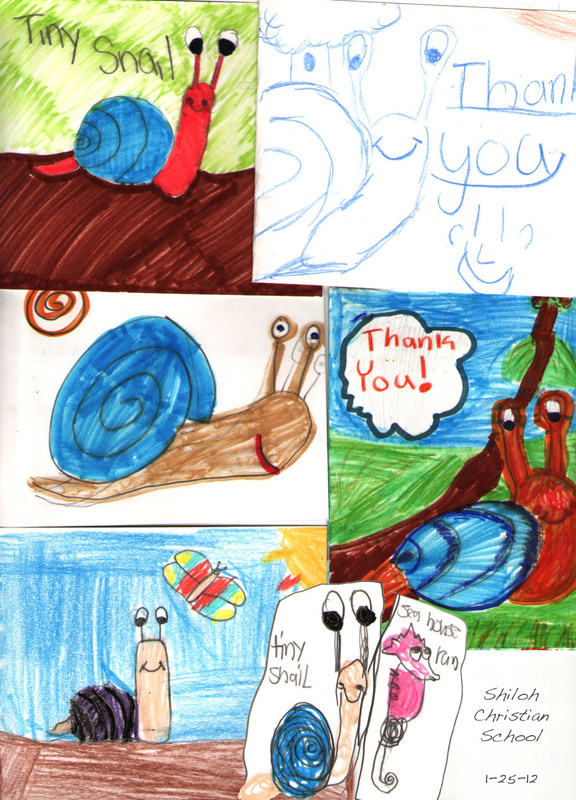 ‘Tamy Snail’ has a nice ring to it! 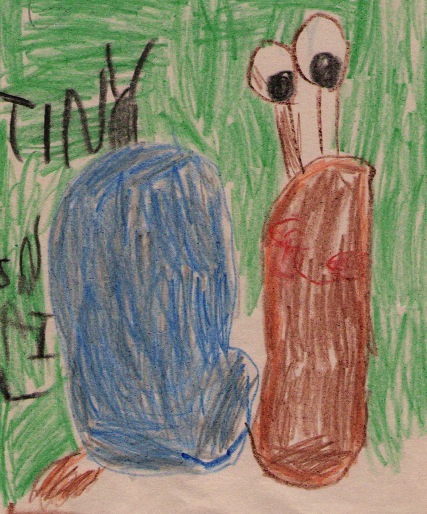 I also love AJ’s Tiny Snail. 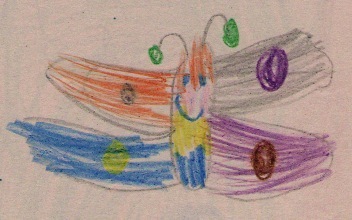 He even drew a colorful version of Miss Butterfly (below). 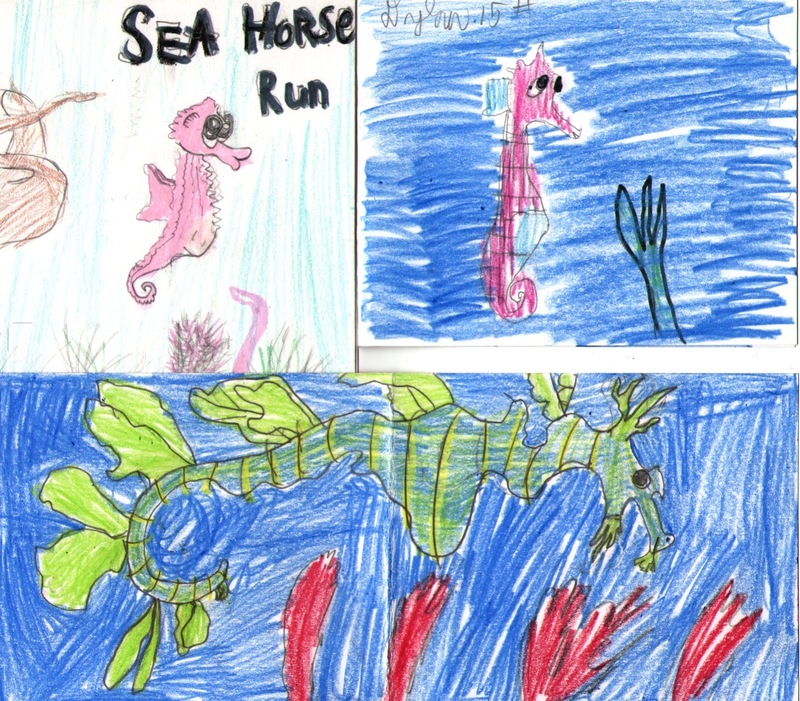 Hope Sullivan students, keep writing and drawing!